OK, no clouds or grumbling today. Just fun. The BCCB has given WINTERGIRLS its 5th starred review!! Thank you, BCCB! However, the indefatigable and ever-organized Julia Maguire is running a marathon to raise $5,000 to find a cure for blood cancer. Julia works at Simon & Schuster and has always been an enormous help to me. If you liked CHAINS, please donate to Julia’s run, because there is no way the book would have been published on time without her. Go Julia! And now….. the magic window. Backstory: It is getting harder and harder for me to find a quiet place to write. My office up in the loft in busy and crowded with “author” stuff: outreach to readers, research, correspondence, etc. In the last two years, I’ve taken several mini-sabbaticals in hotels where I basically lock myself in and crank words. I have enjoyed these respites enormously, but it’s expensive. Back in October, my Beloved Husband suggested that he make me a writing cottage in our Forest. I resisted the notion and found lots of reasons why I shouldn’t do it, but he was right. I need my own version of Walden Pond. Thoreau built his cabin himself. I don’t need to because I am married to a carpenter. We’re in early days yet, but the plan is for “The Cottage” to be off the grid (solar power) and heated with a woodstove. We’re also trying to use as much recycled and sustainable materials as possible. To that end, we went to a salvage yard on Saturday to see what old building elements we could reuse. We found a magic window. It is around 125 years old and came from a church. Loading it up and carting it home was a little nerve-wracking for me, but BH had it under control. Obviously, it needs a little work. No, a lot of work. BH and a buddy of his are starting on the rehab of the wood. Once that’s done, they’ll bring in a glass guy. The window is ten feet wide and eleven feet tall and will take up nearly an entire wall of the cottage, if everything works out. I’ll be posting about the construction project as it happens. Right now we’re waiting for the snow to melt. And now this blog entry is already too long. Writing questions tomorrow, I swear! That is a beautiful window! That would look absolutely lovely with stained glass. That magic window is gorgeous, and I love the idea of the cottage! You must post pictures when it’s all done! Oh wow! Please post pics of the progress! Oh, the magic window is so beautiful and inspiring! I too would love to follow along at home with pictures of your progress. What a find! It’s *gorgeous*! That puppy on a south-facing wall will be a solar heater all by itself! You’ll be the first owner of a five-star cabin in the woods. Okay. Make that ALL OF THE ABOVE. I was about to say all of those things, but you just said them. So, seconded. What a great project! You’re lucky to be with a green carpenter. Keep us posted on your progress. your place sounds soooo amazing! off the grid- too cool. HOLY COW! Stupendous! I am amazed and really happy for you. Hugs for you both! wow, what a great project! The window is amazing! Re: Rose Window. I keep wandering out to the garage to stare at it… it connects me to so many generations of craftsmen that I get the shivers. Love the magic window, Laurie, and the idea of your writing cottage! If you’re ever in the Lancaster County area, give a call (717-445-8246) and stop by to see my husband’s storage shed of reclaimed stuff. He does this Barn Saver thing, you know, and salvages materials, wood, windows, etc. He has antique stained glass, loads of wood, antique wavy glass windows, etc. etc. I’m living vicariously through your project, as I don’t have a forest or a big enough yard for my own writing cottage! We might be taking you up on that offer, darlin’! I can’t wait till May to see you. FYI. I graduate it less than 2 months. That. Is so. COOL! When you mentioned this magic window on Facebook, I was not expecting something so big! And this cottage in the forest sounds fantastic. Love the window, but I would leave it clear, or at least part of it, so you can see out. I live in the woods too, but the upstairs of one section of our house is my office. Both ends have a window and then the Shed dormers on both sides have long windows between the studs. I can see out into the woods in almost every direction. I finally moved the family finances out of my office and downstairs, because they kept me from even going there. The cottage sounds great. I think it will be mostly clear glass for exactly that reason. Your space sounds lovely. What a beautiful magic window! If that window could talk I wonder what stories it would tell? Imagine all the parishioners it has witnessed praying and gathering on Sundays. The christenings, marriages and funerals that its lovely stained glass window shown upon. It saw families through plagues, the great depression and wars. I am so happy to see that this window has been rescued and will find a home with someone that will appreciate its beauty and history. I think the fact that BH is building you your own writing sanctuary is one of the most romantic gesturers a husband could bestow to his wife. To really think about what your spouse needs to make life easier and to help them realize their dreams. More men need to think this way. He sure is a keeper. You are one lucky girl! I am envisioning a little cottage similar to Snow White. Just be careful of an old woman offering blood red apples. I am so blessed to have this man as my partner in life. Thanks for your vision of all the stories the window has seen!! Only Macintosh apples, clean, will be served at my cottage. Trivia – love this kinda stuff! Just for fun – FYI – If indeed this window is 125 years old it would have been built around 1884 it may have been standing when in March of 1884 Susan B Anthony testifies before the House of Representative arguing for an amendment to the US Constitution granting women the right to vote. And the Washington Monument in DC is completed in Dec 1884. Pretty cool huh? Enjoy that window! Re: Trivia – love this kinda stuff! Very cool! Thanks for that!! That sounds like a dream! Yes, please keep posting as it grows. And congrats on the 5 stars! Your cottage sounds like a great idea! And that window is absolutely gorgeous. I’ll be looking forward to your construction pics. That window is stupendous. If I were working near it day after day, as you so fortunately will be, it would end up in a book whether I wanted it or not. Sorry to miss you while you were here… you missed a fun party, but I bet you had a great time with Steph. I’m off to talk to kids and parents, and then back to writing. Since I live in the city I can’t have a cottage with a magic window… I am insanely jealous of your magic window. Maybe I could put a photo of it up on my wall…. Congrats on the stars and all the other good stuff too! That window has me totally green with envy. I’m using Speak to lead a discussion about voice and scene at Bryn Mawr tomorrow. I expect that the young women will teach me quite a lot. Wish me luck. Hope spring comes your way soon! congrats on the 5-star review and i really like that window! can’t wait to read about the progress of and the finished cottage! 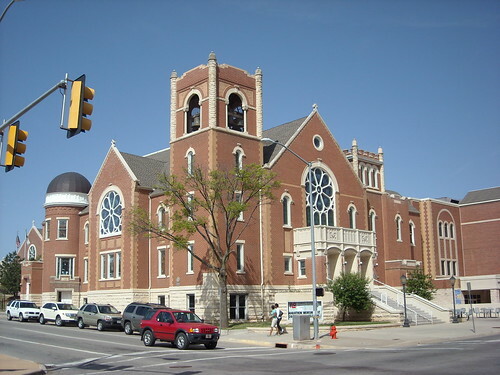 This is First United Methodist Church in Oklahoma City. The church sustained some extreme damage during the Murrah Building bombing in 1995, but were able to reconstruct. Thank you for this, Aunt Barb! Too cool. Your writing cottage will amazing. Cheers for it being off-grid and having that jaw-dropping window. Wowza. Very cool! I’m sure it’ll be very inspiring. Also very cool that you’re building a sustainable/”green” writting cottage! It must indeed be good to have a carpenter in the family! Every family should have a carpenter. I love the idea of a solar-powered writing cottage, and I adore your magic window! looking forward to seeing a photo of the cottage when it is done. Congrats on Wintergirls’ fifth star – you should wear them on your collar. Susan and Theodore Crane surprised their brother-in-law Samuel L. Clemens with this study in 1874. It was placed about 100 yards from the main house at Quarry Farm on a knoll overlooking the Chemung River Valley. In this octagonal building Mark Twain wrote major portions of The Adventures of Tom Sawyer, Adventures of Huckleberry Finn, Life on the Mississippi, A Connecticut Yankee in King Arthur’s Court, The Prince and the Pauper, A Tramp Abroad, and many short pieces. There’s a good intro to it here. Here’s hoping it works as well for you. I had totally forgotten about this. Thank you so much for reminding me!!!! Interesting point… we considered an octagonal structure, but gave up on it when we found the window. That’s cool – the spirits of Twain’s muses must still be whispering through those hills. The interesting thing is that the window has eight circles around its edge – meaning it would fit exactly into an octagon as much as the wonderful circle that surrounds it. You are lucky that your husband will build your cottage for you. My husband is a contractor and I can’t get him to finish the remodel on our house. If he ever does finish, we plan to build a stone cottage beside a natural spring that stays cool are year long. This little piece of secluded paradise is on our farm. Alright….as if I don’t have a million other reasons to be envious…ok maybe envious isn’t the right word. How can you be envious of someone who works so hard to get what they have? ANYWAY…that window, OH MY GOSH! It is insanely awesome. I can’t wait to see pictures of your cottage being built. That window is incredible. You gonna go clear or stained glass? that window is beautiful! and huge! wow. that’s going to be a wonderful writing cottage.